Digital assets are a significant percentage of the world's data today, and are predicted to grow at a rapid pace over the next five years. 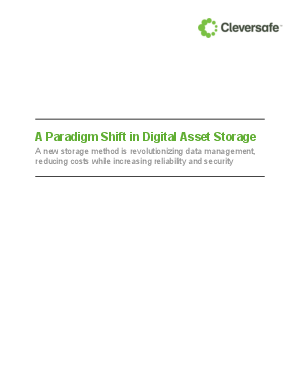 Cleversafe's introduction of a new paradigm for storing and distibuting digital assets allows IT management to eliminate the use of copy-based and parity-based storage solutions. Cleversafe's method offers a significantly more cost-effective and reliable method of storing and securing digital assets. The deployment of a Cleversafe Dispersed Storage Network (dsNet) can streamline workflow while ensuring that data is never corrupt or lost. The network can be situated anywhere in the world, allowing companies the felxibilty to use cost-effective facilities and power options.